Pretty quiet on site today really, with nearly all of the activity in the Maintenance Facility. Work continued on the repaint of the Class 33 and behind, Faraday had brake rigging parts cleaned up and painted ready for refitting. The damp weather prevented coach work outside. There was a flurry activity over in the buffet too as they carried out their end of year stock take before the new season. Of course, this isn't alot at this time of year! Another quiet day at Wirksworth but sunny for once! The lack of volunteers and the sunny weather meant it was a perfect day to rearrange vehicles down the yard to enable projects to continue. The biggest progress today came in the buffet which is having a little mini refit. A new longitudinal counter has been built and some recently acquired catering display equipment has arrived. The majority of seating out of the buffet car itself has been removed and all seating will now be in the adjacent coach. This new layout not only allows a greater range of products, it also will hopefully speed up service reducing queues at busy times. It'll be open for business again on the 17th February when the trains start running. We welcomed a refurbished tamper which will be on test with us next week. 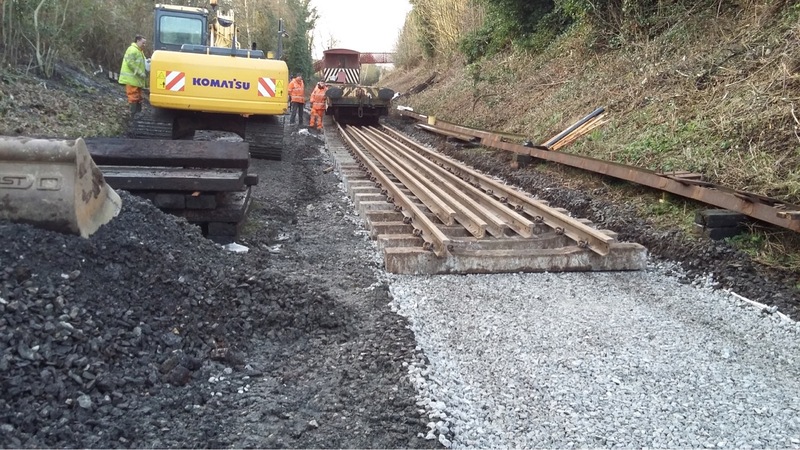 The Duffield relay project is now nearing completion, although motive power issues today prevented good progress on spreading stone. It was generally quiet at Wirksworth but we did welcome a "new" shunter in the form of another Thomas Hill 88c, the sister of Tom called Megan. It is in need of work to make it operational but should be useful eventually. A few brave souls battled the inclement weather today, those who did we're focusing there efforts on several Mk1 Vehicles around the maintenance facility. BSK 34625, was having its end ETH jumper boxes fitted to the underside of the buffer beam and the relevant conduit runs connected..
Also one of the passenger doors was misshapen on the coach, so a replacement door was being fitted and holes drilled trough the bodyside skin and tapping plate to allow the door to be hung for further adjustment. BSK 35006, This coach was also receiving doors. Today the end double doors where being hung and adjusted. with one set having the locks and handles fitted. TSO 4440, the recently arrived coach was having a few inside jobs tackled due to the conditions outside. A start was made to fabricate new Toilet end steps to access the water filter. The toilet drain valves where also being dismantled. A typical January Saturday really, snow falling for most of the day and a few hardy soles down in the Maintenance Facility. The LMSCA are really pushing on with the restoration of their Brake Third coach which is looking fantastic. The ceilings are all painted and the light fittings are coming together. The seat components are now being constructed ready for the marmoleum fitting. The original brake compartment has been reduced in size (we don't carry the amount of luggage that it was originally designed for) and instead one set of double doors on either side is now within the passenger saloon. This will allow great wheelchair access, straight up to a table. This coach was originally a corridor coach but the open layout suits the needs of the railway much more. The Mark 1 BSK(K) which is in the process of more body work repairs and having the compartments put back together is also having Electric Train Heating fitted. A rake of dual heat coaches would potentially allow heating with a relevant diesel locomotive (such as the Class 33) or even from a shore supply over night so that there's less work for the steam heating to do and so that you don't need a steam engine heating coaches many hours before service, costing lots of money. Behind this, Faraday was having more work done on it's bearings and hopefully soon it will be back mobile again. The end of, what seems to have been, a long week with only a few volunteers on sits. There was a gaggle of Station Workers in the Buffet performing some internal modifications to the counter layout to hopefully increase sales capacity. Down the shed, work continued and practically finished on Mark 1 26157's exam. The PW gang had a well-earned day off today. A typical cold, wet and horrible January! Perfect for track work at Duffield. The track panels in the relay project are starting to go back together now and it is looking really good! At Wirksworth, it was mostly coachy types with SK 26157 having the annual exam. A leak was discovered which has allowed water ingress into a compartment damaging part of a seat which will likely need to be retrimmed unfortunately but luckily it was discovered now. The BSK(K) project progressed with a start being made on reconstructing the compartments on that coach and a door being changed. This mornings load of around 80 concrete sleepers were being unloaded on to wagons when I arrived ready for tripping to the renewal site at Duffield. A similar number are due again tomorrow. Down the yard, work continued on trying to ready the coach fleet for the upcoming season. There wasn't a large number of volunteers on site so only pockets of activity. Another cold day at Wirksworth and far fewer members of staff on site today than on Saturday. It was mostly those coachy types who were working away on their various projects. The BSK(K) has started to have the floor put back in and outside, flooring was also the theme as work to repair a flooring problem on the SO continued. Also outside, as it was sunny, welding work on the major bodywork project of the recently arrived TSO continued apace. There were a couple of odd ones out at the back of the Maintenance Facility though… Team Faraday were sanding and filling their cab body work in preparation for painting. Lots going on today, the 8F group were fitting the injectors to The Duke. Derek has fitted the last floor board in the BSK with the help of the apprentice, also the ETH heaters were fettled with. Faraday had yet more filler applied and parts of the brake rigging cleaned. The YMCA (Young Man's Carriage Association) carried on manufacturing their new seats for the BTO. TSO 'Sandy' had bits of it corridor connection removed and James was in attendance. Today saw the removal of most of the Santa decorations at Wirksworth Station. The Grotto was dismantled and removed for storage to be returned again next Year which is completed by outside contractors. And so we start the new year and to be honest, it feels strangely like the last one! We had our Trains and Fizz mini-event on today where a glass of fizz and a mince pie was served on board the train. Good passenger numbers for the time of year were enjoyed as people try and blow away a few cobwebs on New Years Day or perhaps avoid a film on the tele. That's the last operating day for a little while, with services restarting on 17th February for half term.